Our Kitchen to Yours is committed to supporting our local community. We have partnered with Trevor's Vision and we donate and serve hot dinner to over 100 homeless the last Thursday of each month from 6:00-7:00 pm at Grace Lutheran Church (7th Ave & Roosevelt). 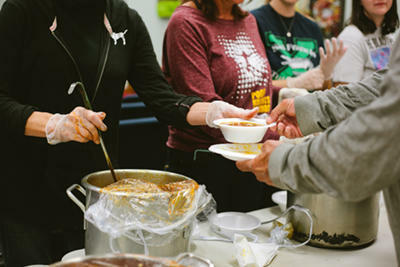 Click here to learn more about volunteering or supporting feeding the homeless. Our Kitchen to Yours also collects used backpacks and donates them to the needy. For more information about “Backpacks Forever”, please contact Donna 623-261-8727. We value and take pride in supporting our community!